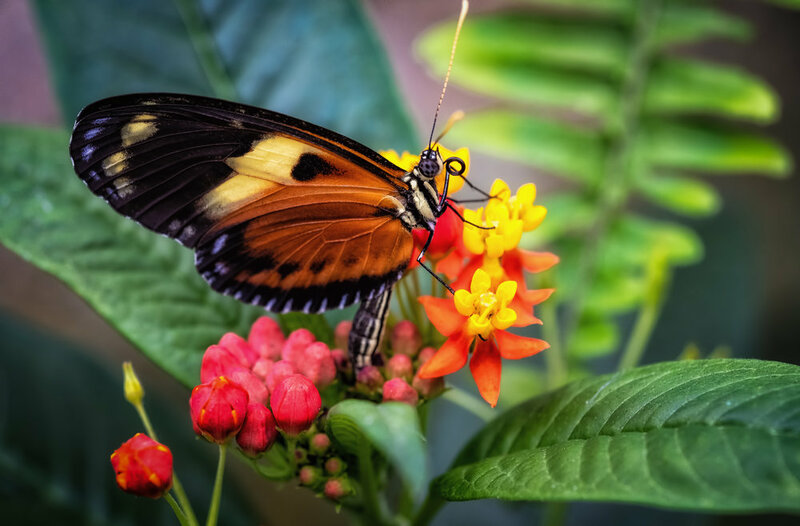 Mariposario - Fujifim X-T3, 1/125 @ f/5.6, ISO 800, 80mm. Shot this at a butterfly garden in Mindo, Ecuador. With hundreds of butterflies fluttering throughout this enclosed space, it was difficult to choose where to start shooting. It was magical! Butterfly with Orchids - Fujifilm X-T3, 1/125 @ f/4.0, ISO 400, 80mm macro. Shot at Mariposario de Mindo; a butterfly garden in Mindo, Ecuador. Jesus on the Bridge - Fujifilm X100T, 1/160 @ f/11, ISO400, 23mm. This photograph was taken on the Charles Bridge in Prague. See the poem of the same title in the Poetry Section. City of Light - Nikon D750, 1/50 @ f/4.0, ISO5000, 60mm - Processed in Lightroom and Color Efex 2, Texture added with Topaz Texture Efex 2. Twilight on the Baltic - Nikon D750, 1/400 @ f/13, ISO 125, 120mm - I hate to admit it, but this was taken from the deck of a cruise ship. Still, we try to capture the best light where we find it. This is one of my highest rated photographs. Time's Arrow - Nikon D750, 1/60 @ f/13, ISO 100, 70mm - This photo was taken at Omaha Beach in Normandy, France. Yes, those colors in the water are natural. Check out my poem of the same title in the Poetry Section! London Light Trails - Fuji X100T, 8sec. @ f/9.0, ISO 200, 23mm - Something of a cliche, but still fun to shoot! Santa Maria della Salute - Nikon D7100, 1/250 @ f/11, ISO 200, 85mm - An average photograph until I added a texture layer. This photo has been shown in a local gallery. Light and Shadow at the Alhambra - Nikon D750, 1/30 @ f/4.0, ISO 6400, 62mm - Shot on a night visit to the Alhambra in Spain. I had to hand hold this one. I altered the toning in post and diffused the lighting. This image has been a very successful one for me. Gettysburg Dawn - Nikon D7100 - September sunrise from an observation tower on the first day's battlefield. Gettysburg National Military Park. This photograph appeared in a juried show. Windmills of Mykonos - Nikon D7100, 1/160 @ f/14, ISO 200, 25mm - The circular polarizer made the shot. One of my most popular photographs! The Hermitage - Nikon D750, 1/60 @ f/6.3, ISO 1600 - I don't recall exactly how long I waited to get this shot without people, but it was awhile. Worth the wait, though! This place has to be on your bucket list. Calle Benito Juarez - Nikon D7000, 1/200 @ f/11, ISO 100, 34mm - A small village in Oaxaca, Mexico soon after sunrise. The mist blanketed the dirt streets, further diffusing the soft light. I have shown this image in a local gallery to positive feedback. Paris in the Spring - May 2018 - Nikon D750, 1/80 @f/13, ISO200,34mm. I always wanted to go to Paris in the Spring; and we finally did. See the poem about our experience in the Poetry Section. Juno Beach Memorial - Nikon D750, 1/320 @f/8, ISO200, 58mm - I found this impromptu memorial more moving than the official one! Dancing with Balloons - Hudson Valley Balloon Festival, Summer 2018 - Nikon D750, 1/125 @ f/7.1, ISO200, 70mm - See my poem of the same title in the Poetry section. Old Town Square - Fujifilm X100T - 1/250 @ f/8, ISO200, 23mm. Shot in Warsaw, Poland. Paddington Station - Fujifilm X100T, 1/90 @ f/8.0, ISO640, 23mm. A popular seller!. Prague Chocolate - Fujifilm X100T, 1/60 @ f/8.0, ISO3200, 23mm. I took this photograph at dawn before the crowds of tourists arrived. Only a few pigeons and a couple of rats to keep me company. It was quiet and beautiful. I recently sold a copy at a local gallery. The diffused color of the image was generated in Topaz Impressions 2. Dimming of the Day - Fujifilm X100T, 1/125 @ f/3.6, ISO400, 23mm. As photographers, we are always looking for that special light. I found it one early spring evening in a small Ohio farmhouse that belonged to one of my sons. This is the breeze-way just minutes before the sun set behind the hills. It’s a poignant shot for me because my son and his family have since moved out west. After visiting this home for six years we will never see it again. But I have this photograph any many others to keep the memories alive. On a bright note, the rocking chair did make the trip. Oh, and I borrowed the title from a Bonnie Raitt song. Rainbow Falls - Nikon D750, 2.5 sec @ f/10, ISO100, 24mm. One of the great photo destinations in central New York. Make sure you get there early to avoid the crowds and bring your tripod. Laguna Quilotoa - Fujifilm X-T3, 1/250 @ f/10, ISO 160, 16mm. A volcanic crater lake in central Ecuador. The colors of the lake vary from teal, to deep blue, to vibrant green. A spectacular view! Alone in the Square - Fujifilm XT-3, 1/60 @ f/2.8, ISO 800, Spot, 35mm. Took this shot while walking the streets of Old Town Quito at night. See the poem “Ecuador” in the Poetry Section. The Photographers - Nikon D7100, 1/640 @ f/8.0, ISO250, 80mm. This was shot from the grounds of Olana overlooking the Hudson River and the Catskill Mountains. Although we were there to shoot the sunset, I was intent on capturing my fellow photographers at work and in silhouette. Notre Dame - Nikon D750, 1/200 @ f/13, ISO100, 35mm. Shot this in the Spring of 18. Like so many citizens of the world, absolutely heartbroken by the damage done to this beautiful cathedral in the recent fire.